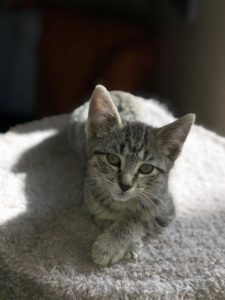 Clover – Female DSH 12 Weeks a 4/11/19 fa – Foreclosed Upon Pets, Inc.
Clover is an energetic girl with a beautiful tabby coat. She also has a good appetite and loves her soft food. She is almost always found playing with her siblings. She loves her noisy toys and will play for hours. Adopt fee is $125.00.